PSPrint has a 50% off deal, so I am going to print a pile of these to pass around…. …feel free to post this jpg up where ever you wanna…. If you didn’t notice the link to the page “RIDE TOO!” up on the top masthead of this site, then here’s the info in the RSS feed. 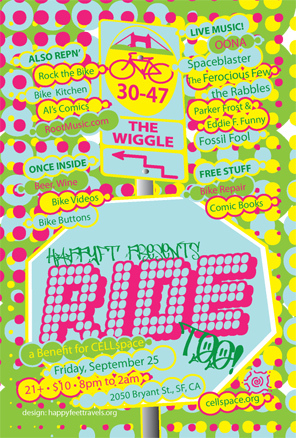 All the bands just confirmed and locked down for what looks like a great night of bikes, bands, and beer! Well, there’s a bit more than that, but that’s how I keep pitching it to folks. Two January’s ago, CELLspace needed a huge help from the community. I’d been away from CELL for a few years, doing my thang, and bikes and bands were a part of that. So I concocted RIDE! and got a nice list of bands to hop on board for the night. Turns out my captive audience, Critical Mass, was totally rained out that night. But my planted promoters got most of the ride to come to CELL, soaking wet. Then Mike Hoffman and David Sartore’s band “Bring Your Own Laser” brought a smoke machine that set the fire alarm off! Quiet a crazy night for a low-attended event. But the thing is, which still amazes me, is that the event still made $$ for CELLspace. Not a bunch, but between the beer and the lemon squares, we pulled in $150 for CELL! Amazing, so I still call it a success of mythic proportions. If you were there, you remember and smile with nostalgia…..
Hey there. Did anybody miss me? Has the webos-cloud of attention moved away from the humble digs of HappyFeet Travels? I can only guess that you all have been sucked into the micro-webos clouds of Twitter and FaceBook. Huh? Have you? So easy to blog in 100-ish characters or less, isn’t it? Simple to throw some links to vids, articles, and pics over on those sites, yes? Beyond bands, has anyone wandered to the MySpace-webos cloud lately? They’ve made it less blinky last I checked, which was a while ago! I’ve been laying low for several reasons. Getting off of a year of touring and promoting and producing has been part of the reason. Resting, regrouping, and reconnecting has been another. Not feeling like I have much to say that isn’t too personal (I don’t post too personal here) is yet another reason for the blank cal on this site. And just plain coming to grips with life in the microcosm of the reality-cloud we call a crappy economy has been another. Things here at HappyFt HQ are feeling caught up. The Fall is looking great for potential creative endeavors. Some of them might actually help me pay the rent! On the book front, Stencil Nation is currently “out of stock” while Manic D tries to figure out the future in what is now a glutted street art book category (we were there before the wave crested…. I beat the crowd once again!). I still have some banged up return copies that I’m trying to sell on my site. A few have gone out.